The next step, of course, is monetization. At this stage, I am more interested in understanding how people will react to a commercial on a second screen, rather than actually making money. I have yet to see a study on how a TV ad can be made "clickable" on a second screen. Personally, I believe this is the future of TV advertising (which still represents 85% of all advertising, BTW). TV advertisers spend one million dollars for a SuperBowl ad, and they do not know who is watching it, what they like and they have no way to get a feedback from viewers. TV ads are not clickable today. If I am watching a game on TV and I have TOK Baseball open, when the commercial break starts, the game stats are not that interesting. What is interesting is the actual commercial (at least, some of them). What if I could click on them, when I see something that I like? What if I could get to a web page and interact with that brand? Guess what? The future of TV advertising is here. If you download TOK Baseball and use it during a game of the World Series tonight, you will see it. During commercials, a thumbnail of the ad you are listening to will pop up in the bottom right. In the example below, the TV is showing a Dodge ad (one of my favorite ones). 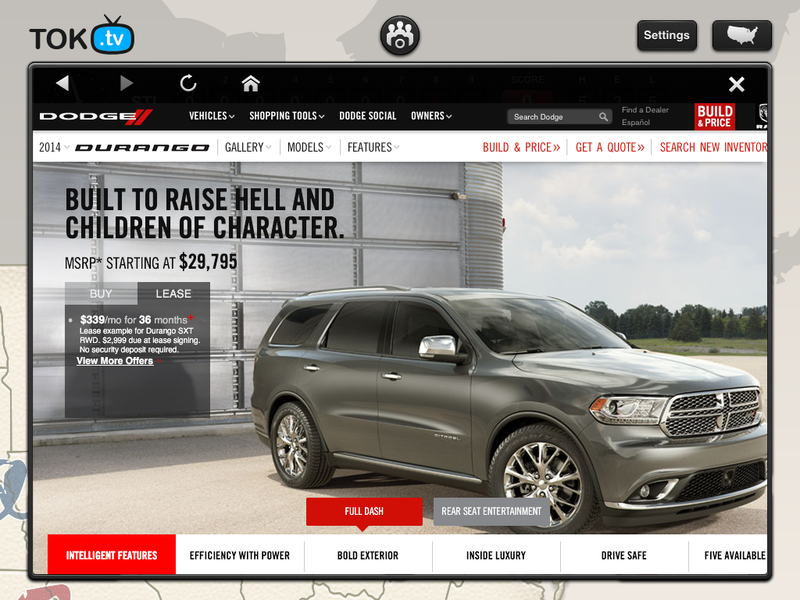 When you click on that thumbnail, a webview will open, bringing you to interact with the ad on the Dodge web site. The nice thing is that you do not have to exit the app, or stop talking to your friends. Actually, you can talk with your friends about the ad itself - which is pretty cool. Ad most watched last night? Verizon Stars Wall Halloween. Ad most clicked last night? Chrysler 'Road to Greatness' Featuring Miguel Cabrera. This is just the start of the revolution. Stay tuned. During the weekend, I read an interesting article about the "Android First" strategy. 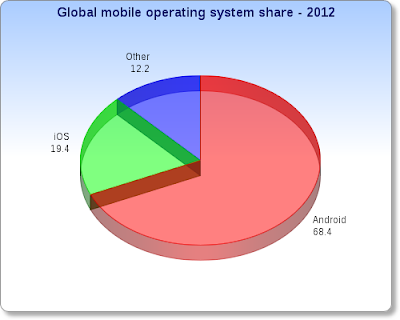 Now the question is: should you go iOS First - as everybody has been doing for years - or is it time for Android First? Should you design and release your first product for Android, and then for iOS? The article says no. Just go with iOS. All VCs in Silicon Valley have iPhones and iPads. If you want to raise money, that is the way to do it. Android comes later, when you proved you can grow. This is where the reasoning breaks down, in my opinion. Let me start with TOK.tv. We thought about a completely new interaction with the second screen, in front of the TV, using voice. A couple of years ago, there was no argument: the iPad was king, we built iOS First. Then we added iPhone, because it was easy (and because we had a US-centric product in TOK Baseball). 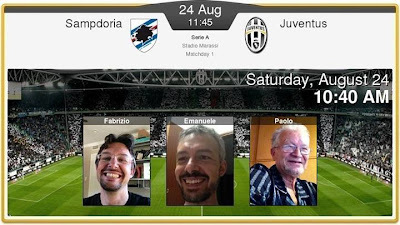 Then we launched Juventus Live. US users currently represent the 2% of our user base, for a team that has 7M+ fans on Facebook. Last summer, I was shocked when I started looking at which device people were carrying in Italy. Blinded by my life in Silicon Valley, I assumed everyone had an iPhone. My Italian developers were Apple fan boys, my sister-in-law had an iPhone, my nephew an iPod Touch. When I looked closely, my sister-in-law had actually dumped her iPhone for a Samsung Galaxy. My brother had a Galaxy. My nephew had a Galaxy. Everyone I knew had a Galaxy... Those who had an iPhone 4 skipped the upgrade to the iPhone 5 and moved to Android. Therefore, I started looking for numbers - which are hard to find - to discover that Android has 80% of the market in Italy, while iOS is stuck at 10%. It is not just China. 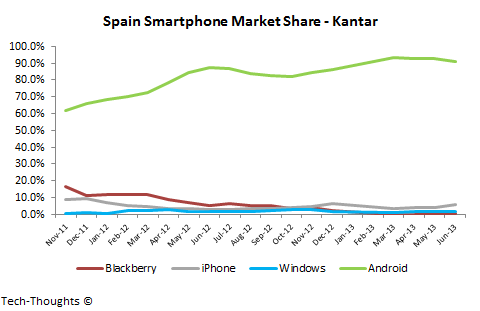 Look at Gartner numbers in Spain. What is happening across Europe, is that people are buying Android phones, because they are cheaper. When the economy is not doing too well, it makes sense to save some bucks. 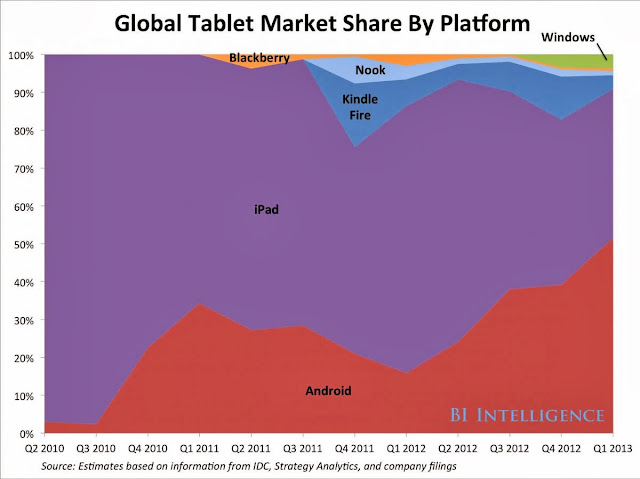 Ok, you might argue that pure market share is not a good reason to go Android First. After all, the US is fifty-fifty and Silicon Valley is heavily iOS centric. Would you risk building an app first on Android, when VCs can't test it? Well, there is an interesting trend in the Valley these days. To raise a Series A round, you need millions of users of your app. One million does not cut it anymore. You need more than that, probably much more. If you stick to iOS-only, you might not get there fast enough. Those who start with Android will be there 8 times faster than you. Ok, I am exaggerating, I know Android users are different and do not use apps like iOS users do. Cut me some slack here... Shall we agree on 3x faster? That is the difference between running out of cash or not. Should you start Android First? If you are building an app that is not just for Silicon Valley, or the US, I believe the answer is yes. I am definitely doing it. I have developed software for more than twenty years, and I am still amazed at the surprises you find along the way. You design a product, with all the use cases you can think of, then the users find one you never thought of. Yesterday, that user was me. I am still in the middle of a move. My living room is a mess, with 28 boxes to go (it is usually a good sign, when you feel you can start the countdown). Among other things, I am still missing the Internet and TV. I could get Internet via my MiFi (somewhat reliable, but slow and with limited monthly bandwidth), but I have no chance to get TV. I am waiting for the DirecTV dude to come and install the dish. I could get Comcast fast, but they do not carry beIN Sport in HD. There is no chance I am going to watch Juve in SD. It would be a sacrilege, like drinking espresso from a paper cup. Clearly, Juve was on the attack. In fact, a few minutes later they scored. My nephew was also there and he told me he really liked the app. Coming from a teenager, that meant a lot to me. Of course, he is a Juventus fan as well. It is a DNA thingy. All of a sudden, I was kinda-watching the game. Kinda. I could hear my family talk about the game, and the audio commentary coming from the TV (Beppe Bergomi was trying to jinx Juve, failing as usual). A million times better than listening on the radio. It is the radio plus your friends plus the stadium noises. I grew up listening to the games every Sunday, on the radio. It was a religious thing, every Sunday after lunch. When TV rights allowed us to watch the game live, our life changed. However, I still remember us all around the radio, cheering. Looking back, it was weird, but really fun. The use case I discovered is not completely new. One of my friends used to call me from his office during the World Series last year, to talk about the Giants. I was doing the commentary for him. It was fun for me, but I had never experienced being on the other side. It happened yesterday. A second screen app transformed in a radio app, with hormones. What a surprise. I will never listen to the radio during a game again. Software is the best thing ever invented. Saturday, I woke up tense. Quite early, because I am still jet-lagged, and definitely tense. Juve was going to play at 11:45 am and I had no clue what to expect. We had tested the servers for a peak of users, but the amount of downloads of Juventus Live since Thursday had been incredible. On top of it, I knew that baseball tends to spread the users during hours - and 15 games the same day - while the Juventus users would come in all together at the same time. Before the game, I called my dad on Skype, as I always do every Saturday at 10 am. He tried to answer with Skype on his iPad, but it did not work. Therefore, he called me back from his computer. 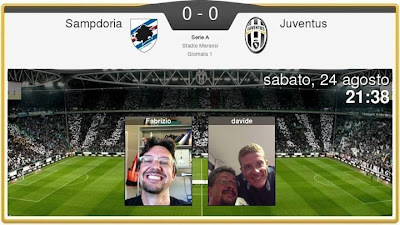 He told me he downloaded the app, so we tried a call on Juventus Live - assuming it would not work (since Skype wasn't). Instead, it worked perfectly. My dad told me: "TOK.tv is better than Skype". Dads are great. That already made my day, until a minute later I heard tok tok on my iPad: my younger brother came online (he lives in Mozambique, Africa). I added him to the call and we started talking about the game, making all kind of noises. We took a social photo to remember the event. Once we were done, I realized I was talking about Juventus from California, with my dad in Italy and my brother in Africa. Three continents, united by one passion. Amazing. Then I went back to work. Found a problem, fixed it and started looking at the wave of users growing. I stopped accepting calls from friends, to make sure I was focused (although I had the game in background). Everything went smoothly, and I finally relaxed, once the first half was over. At that point, my older brother called. I used to watch every Juve game with him and my best friend Alberto. I do not think we missed one in the ten years I lived in Pavia. 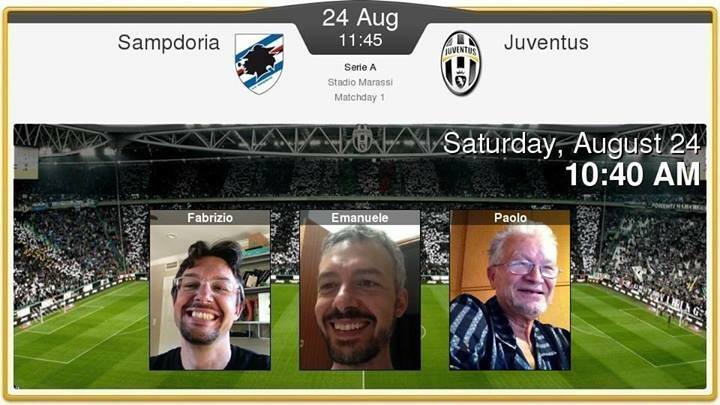 We called our little group the Juventus Club La Mamma, because it is the one thing you cannot criticize. Juve is always right. The penalty against us are simply a mistake by the referee. Our goals are never offside. When Juve scored, the amount of concurrent users shot up. Sign that people called their friends to celebrate, and to take a photo together (I definitely was one of them). When the game was over, same thing. Actually, the highest peak came exactly at that moment. People kept the app around for the entire game, coming back to it at the end. That is really great, for us. 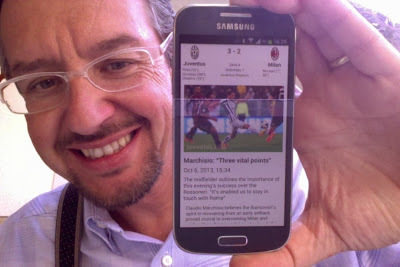 Last social photo, to celebrate the victory, with my dad and the Juventus Club La Mamma. Once everything was over, I stopped for a second. I was tired as if I actually played the game, but I had a big smile on my face. 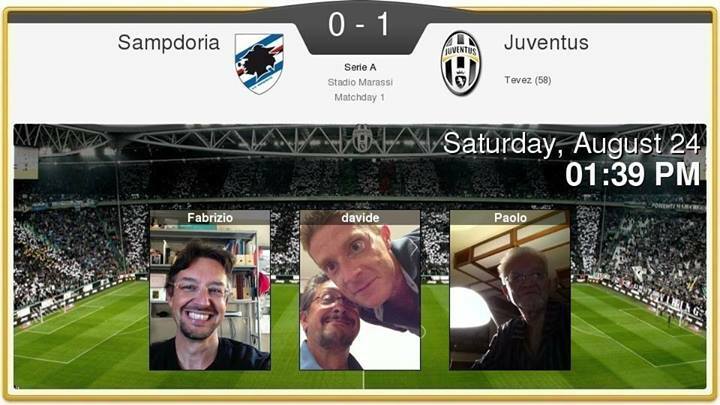 We had a ton of users, the servers worked perfectly, Juve won and I enjoyed the game as I never had in almost fifteen years living in the US. I built an app because I had a dream. The dream to watch Juve with my family and friends. Yesterday, that dream came true. I am such a lucky man. The day after the SuperBowl, I had mixed emotions. I was licking my wounds for the loss of the Niners, but I was really happy for the amount of users and the feedback TOK Football received. Then, out of the blue, an email hit my Inbox. There was a logo in the signature. Big, visibile. The logo of my soccer team. Juventus. The best team in Italy, one of the top ten in the world. There are few things in life that give a man emotions. One, it is the logo of the team he rooted for, since he was a child. For me, that is Juventus (the Giants, the Niners, even Ferrari are passions I acquired along the way). Juventus is the one love my dad passed to me. Something that is in my DNA, and will ever be. The email said they tried the app and were really impressed by it, and they wanted to talk to me. As any geek would do, the first thing I did was checking the raw source of the message. I have been the author of multiple pranks in my life, surrounding emails. This one looked like a potential good prank from a friend, but the SMTP server was mail.juventus.com, and the IP from Turin, home of Juventus. As legit as they come. It was not a prank. Of all the teams in the world, it was my team. Out of nowhere. They wanted TOK.tv, for Juventus fans, like me. When my ultimate goal when I started TOK.tv was to talk to my dad and brother, during Juventus games... What are the odds?? Unbelievable. Today, a bit more than six months later, we are launching Juventus Live. 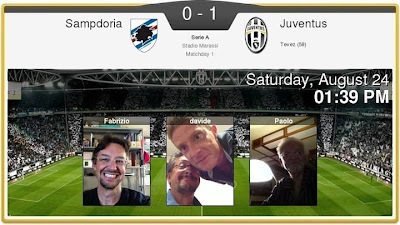 The TOK.tv app that allows Juventus fans to talk to their friends, while they watch their team on TV. It is a big deal for us. Juventus has 6.8M fans on Facebook. They are a huge brand worldwide. TOK Baseball is doing great: I am hopeful we can get to 100,000 users by the end of the season. But this is different: our little brand can do so much, but with Juventus on the cover, we are going to get to that million of users in a few months. And if you want to know if there is a burp sound... No, there is not. But I am going to fight to get it back in. Maybe, before we get to that million... As usual, stay tuned. I have never thought about starting a social enterprise. I always begin from a need I have, and I go about solving it. For Funambol, I desperately needed a way to keep my devices in sync, starting with my address book and calendar. For TOK.tv, I was tired of watching sport on TV alone with my dog. I am a big fan of social entrepreneurs (like my friend Villy, the CEO of Baycat, pictured left bothering Giants fans before a postseason game at AT&T Park). One day, I wish I could be one. However, some days you realize that - even if you do not aim for it - you might get lucky and do something good. On a late afternoon of a great 4th of July, I was checking the stats of TOK Baseball. Do not ask me why, it is a compulsive thingy for startuppers. We live and die by our stats and logs. I usually do not care about usage per country, since our app is used almost only in the US. However, for some reason I clicked on the "session duration per country" link. At the top of the list, I saw Afghanistan. Bam, it hit me. The longest sessions we have are from Afghanistan. Our troops talking baseball with their families. How cool is that? On the 4th of July? Unreal. I left home thinking about that guy sitting somewhere in Afghanistan, with an iPad in his hands, yelling for a triple with his kid, at home during a 4th of July celebration. It made my day. Hey, even if you are a selfish entrepreneur, sometimes you do good by accident. I am a lucky guy. Is the iPhone a good Second Screen? When we started TOK.tv, we had a certainty: people will prefer to watch TV with friends, rather than alone. We were convinced that they would also prefer talking to a friend, rather than being forced to type. We ran a bunch of tests, with baseball, then football, then the Oscar night. The results proved it: talking is more fun than typing. Our users spend a long time talking with the app, compared to normal mobile app usage. We are talking 20 to 50 times more. A second screen app on a tablet is not a mobile app, it is a couch app. That changes everything. It is closer to a desktop interaction, than a mobile one. However, it happens in a relaxed environment (on the couch, rather then sitting in front of a computer), which makes everything more fun. TOK Baseball has been a great success. Over 30,000 downloads in two months, thousands of users coming back daily, with average talk time of 24 minutes. We reached the Top 6 Sports app in the App Store, in front of ESPN and big brands. We found out that the more our users talk, the more they come back, the longer they talk. Awesome. I have to say we were hopeful it would happen, because we tested it for almost a year and we knew the user experience was great. Now, however, we are moving one step further. Into unchartered territory. Today, we launched TOK Baseball for the iPhone. It is available on the App Store. We have no clue how people are going to use our app on a smartphone. It is not a tablet, it is really a mobile device. 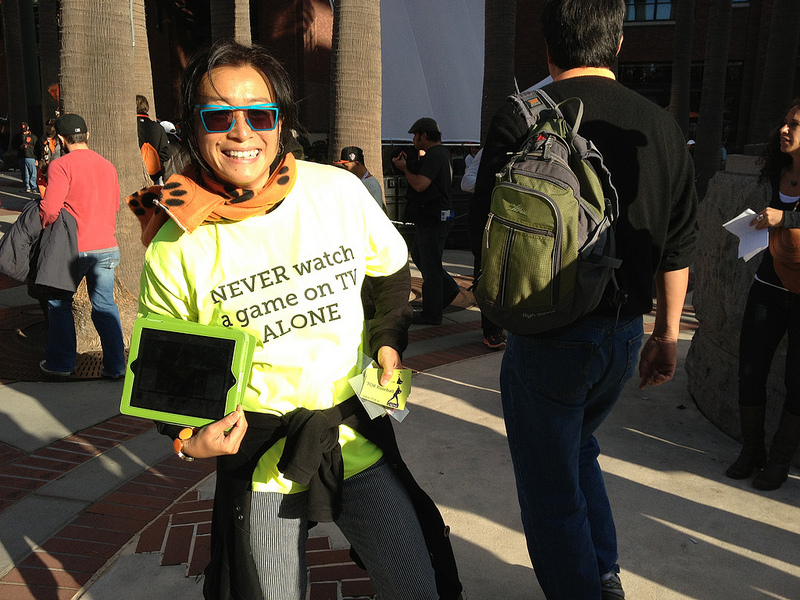 Are you going to use it on the couch as the tablet app? Or on the go? At the ballpark? On the train? Even when there is no TV? It is going to be fun to find out. We have no test data, no experience... We have nothing. In a few months, we'll know a lot. I promise I will report back as soon as I find out. For now, please try it out and let me know. As you might know, we have been working on TOK.tv for a while now. Our goal is to let you TALK to your friends while watching TV, making sure you will never watch TV alone, while enhancing the overall experience. I am convinced that the Second Screen market is the next big thing (Mashable put it as the #1 trend for 2013, so I am not alone). I have never seen a market that is nascent, where the desire by end users is incredible (80% of people use a mobile device while watching TV today), and the business model is obvious. The convergence of TV brand advertising with Internet transactional advertising is the Holy Grail of advertising. 85% of ad spending is still on TV ($200B/year...). Companies spend a million dollars for a SuperBowl ad, having no clue who watches it and what kind of people like it. Moreover, they have no way to give you an action to follow-up on the ad (i.e. "click"). If Google built a zillion dollars company with the remaining 15% of the ad market, I am sure there is a big company to be built here, one that allows you to "click" on a TV ad because an icon pops up on your iPad, while you watch a commercial. We think TOK.tv is going to be that company. Simply because we nailed the user experience. We tested voice as the medium to share emotions while watching TV, and we discovered it changes everything. Last October, we ran a test during the baseball postseason. 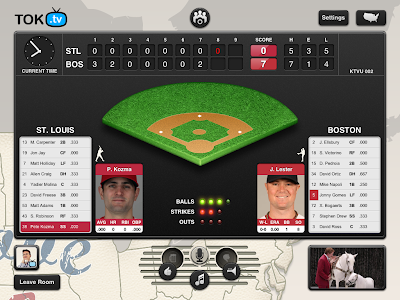 TOK Baseball allowed users to watch a game on TV, with the scoreboard in their hands, talking to their friends. Because watching TV is a passive experience, voice is just perfect. People used our app for 57 minutes during each game (on average). Talking to their friends, while leaving the iPad on the side of the couch and kicking back. It makes sense, but we proved it. In January, we ran a second test, during the football postseason. We saw 50% of baseball users move to TOK Football and we added a Facebook integration, which made the friendship numbers balloon (from one to eight on average). Yes, the additional content is important, but the key is the social interaction. Then in February, we ran our last test, during Oscar night. Despite no advertising whatsoever, we had four times the users we had during the SuperBowl. And 68% of them were ladies. It proved to us that the model works beyond sports (and that it is true that ladies like to talk ;-) It was also the first test of the TOK.tv platform, the way we will scale, allowing others to provide the content. Finally, we are done with tests. We are now ready for take-off. 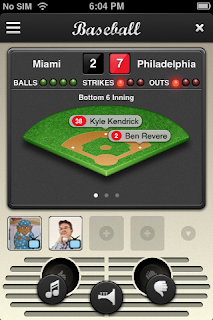 Today, we launched TOK Baseball 2.0. It is not a beta anymore, it is the real deal. We added content so that the app is useful before and after the game, not just during the game. And a lot of cool stats. You can check it out on the App Store. We have a pipeline full of incredibly cool features (and an iPhone version), plus a series of spectacular apps (yes, we'll do soccer and basketball, I promise). Stay tuned, the sky is the limit. There are days where a trend you noticed becomes absolutely visible. Today is one of those days. I have seen the Android brand disappear over time. First, it was the Nexus, then Samsung came with the Galaxy brand, who made Android less relevant. Now, Android is just invisible. I thought Google was losing a war against its partners, but I finally concluded that it cannot be just a coincidence. It is not just a trend. It is a deliberate effort. By Google. At Mobile World Congress last year, Android was everywhere. The Android space was the biggest of all. It was all about Android and a bit about the hardware manufacturers. This year (BTW, if you are going to Barcelona and you want to meet, just let me know), Android will be absent at MWC 2013. No space, no booth. Gone. If you read about the new HTC One, you'll have a hard time finding Android anywhere. HTC is trying to promote its brand, Android is way in the background. Gone. Of course, Android is dominant. 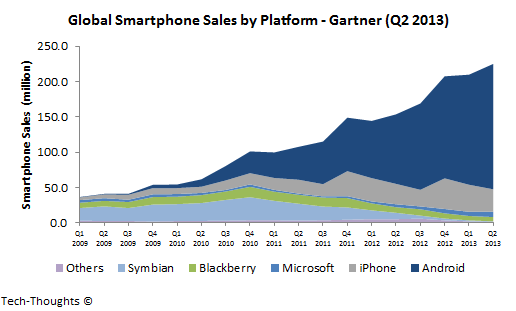 So much that saying you sell an "Android phone" makes you a cheap commodity play. Nobody wants that, they all want to be cool and different. Leave Android to the Chinese knock-offs. However, it is not just the device manufacturers. It is Google killing the brand. They moved away from it when Android Market became Google Play, and they are distancing themselves even more now. They want Google to be the brand, not Android. Risky business? I am not sure. Who cares about Android? Developers. Only developers. Even if you water down the brand, developers will know it ;-) It does not make a difference. You are not going to lose developers because you are de-emphasizing the brand. However, having two brands confuses consumers. Google is planning to open flagship stores. They bought a hardware manufacturer. They are changing, and they want Google front and central. Who knows the word iOS? Nobody (oh, you do, but you are a geek). People out there know Apple. They know iPhone and iPad. iOS is for geeks. It is hidden inside. For those who can tell the difference between a V12 and a V6 engine (see, maybe you are not a geek after all). Android is now so dominant, it can be killed. Because it is just what's inside. What matters, it is the outside. Gone is Android. Killed by its own father. Believe me, you want to buy a Google. During the Super Bowl yesterday, we had an explosion of downloads and users for TOK Football. I do not really remember the result of the game (ehm), so I decided to do a check of some stats to figure it out. What I found is the chart below. What the chart shows is how many times the users clicked on a particular noise in the app. The focus is on two noises: burp (you might imagine what the sound is) and defense (which is the D# chant). I plotted them over time, from the Wild Card to the Super Bowl. What I found out is that DEFENSE was less and less a concern. 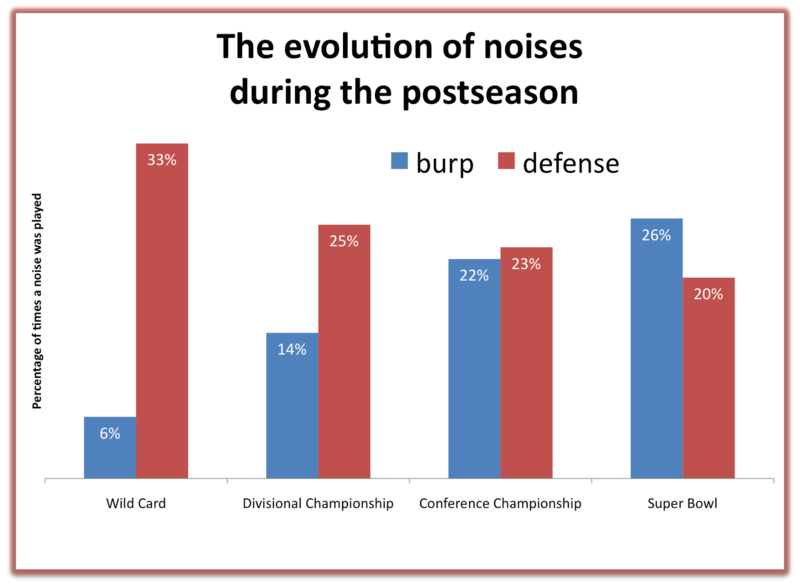 Apparently, during the Wild Card, offense does not count much, while in the Super Bowl it is all that matters (and the MVP is usually a quarterback). What is interesting is that BURP grew over time. That tells me people do not drink much during the Wild Card, but they go nuts as games progress. I am not sure if it is due to celebrations or to forget the result of the game. The day before the big 49ers game, NBC news had a segment on second screen. We were a bit surprised they decided to dedicate it entirely to TOK.tv (but we did not complain). What I found very encouraging is that they described the app better than I would (I am taking notes for my next presentation ;-) even using the TOK/talk joke effectively. Something must be working in our marketing story. Good sign. Let's keep plowing ahead. Today is a great day for TOK.tv. TOK Football can be downloaded from the App Store, worldwide. 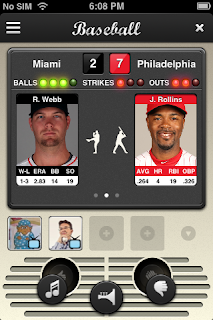 It is our second second screen app, after TOK Baseball. It allows you to talk to your friends while you watch the NFL postseason. We are very excited about it. Because one number hit us about our experience with TOK Baseball: people have used the app, on average, for 57 minutes per game. 57 minutes, with our app open, in front of a TV. On average (a lot of folks had it open for three hours...). If you stop and think about it, it makes sense. A second screen app is technically a mobile app, but it is used in a static environment. On your couch. In front of your TV. It is not really a mobile app, even if it is enjoyed on a mobile device. When you are on your couch, you are relaxed, in a passive state. An advertiser can hit you with a commercial for 30 seconds, and you are going to watch it. Yes, I know, people want to change channel during commercials, but they rarely do. In particular, during a sport event (what if I come back late and I miss the touchdown?). With a second screen on your lap, when someone or something gets your attention, you transform from passive to active. You jump on your device and act. Anybody with an iPad knows what I am talking about. During a game, a news event, a movie, anything. They say something you are interested to know more about, and you are on your iPad searching. The same is going to happen with advertising. You see something interesting on TV, the app in front of you will pulse so you can act on it. Act means also transact. Synchronized ads between TV and the second screen represent the future of advertising. It is a multi-billion dollar market. If you think about the ad model of the Internet, it is all based on transactions. Done with a mouse, in a working state of mind. When you are relaxed and on the couch, you are in a better mood to spend. Advertiser will catch you off guard. It is even better than traditional online advertising. Then, you add a TV on top. You have it bundled in the perfect state of mind (on your couch) with the most intuitive device on the planet (a tablet, with a touch screen). A second screen app is a mobile app with hormones. Ok, not every second screen app will lock you in for 57 minutes (we have our special sauce, linked to the social nature of our voice-enabled platform), but for those who achieve what we have, it is going to be huge. We offer a full meal, not just a bite. It is fun, and social, and you have no reason to leave. Second screen is already a top trend for 2013 (#1 for Mashable, and many others) and it is growing faster than anything I have seen in my career. If history tells me something, it is that new trends grow faster than the ones which came before. I expect an unprecedented growth. 57 minutes. Second screen is a new paradigm, with the most powerful business model attached to it. That is why it is a big deal.